Ikaria is an island that many know of yet few ever get to experience. It’s a place that has caught the attention of the media the world over, yet where many of its residents have never travelled away from. It’s an island rich in natural resources, inhabited by people who are reluctant to exploit them. Acting as an Aegean Mecca for surfers, mountain climbers and cyclists, while still living life at a snail’s pace. If you’re searching for the Greece of days past, a milieu of breathtaking landscapes and welcoming locals, Ikaria will not disappoint. The impeccable health and longevity of its islanders has garnered the island plenty of well-deserved publicity throughout the last decade. It ranks only behind Japan in the percentage of residents aged over 100 years old, and whether or not that is attributed to its healthy cuisine or slow speed of life, is a question asked by many who wish to scratch the surface of this elusive isle. Named after Icarus, the unlucky son whose father Daedalus had constructed him wings out of feathers and wax and warned him of flying to close to sun. Unfortunately, the young man did not heed his father’s warnings, and plunged to his death after his wings melted from the sun’s heat. The island of Ikaria stands at the place where the boy supposedly fell, and there is even a spot on the island known as the “blood of Icarus”. The moral of Icarus’ tale can ironically be seen in the way the present-day islanders live out their lives. Too much ambition, to much hurry can be catastrophic, and the slow, leisurely lifestyle of Ikaria’s residents surely plays a role in their world-renowned longevity. The island was also a place of exile for several supposed communist sympathizers, the most famous of which was Mikis Theodorakis, one of Greece’s most famous composers. This has certainly had an impact on the lifestyle and mentality of the island, where communist candidates often prevail during national elections. But the island’s incomparable beauty could also justifiably be the reason why people take their time here: every corner of Ikaria is filled with immense natural beauty, from the Athera mountain range often covered by a blanket of feathery clouds, to the 200 year-old forest of Ranti, the largest of its kind throughout the Eastern Mediterranean. Its also the home of several amazing beaches, many of which look as if they belong to the isles of the south pacific rather than the Aegean. Some of the most noteworthy include windy Messakti and Armenistis, some of the few places where surfing is actually possible within the Aegean. Seychelles beach in the south of the island is also a rare sight in these waters, complete with turquoise waters and volcanic-looking rocks. Health and fitness enthusiasts will appreciate the dense forests, rivers and mountains of its hinterlands, providing the perfect backdrop for hikers and bikers. Paths leading to villages hidden within hillsides, cliff-top mountain springs and waterfalls challenge and inspire walkers of all ages and abilities. Hydrotherapy is also popular here, with the island’s hot springs featuring some of the highest levels of radon and beneficial properties throughout the region. And healthy foodies will relish the pure cheese, olive, oil, herbs, fruits, vegetables and honey used to make a number of delectable dishes. Fear not, if you’re looking for an opportunity to re-tox rather than detox, the large network of villages, each one unique and picturesque, take celebrating to the next level with night-long feasts and festivals. The island’s home-made grappa known as “tsipouro” packs a punch, and wine-making here is a revered art, respected and undertaken over millennia. One of the best things about the island though, is its simplicity. Here, it isn’t uncommon to walk into an empty shop, leave whatever money you owe and continue on your way. Locals care enough to help should you run into trouble, not enough to mind who you are or where you come from. It’s a place where a meal can go on for hours and include another two or three servings before calling it a night within the wee hours of the morning. With so much beauty and hospitality to offer, the secret to Ikaria’s longevity is worth taking a shot at discovering. This wild, secluded beach is a favourite for explorers and those looking for a bit of adventure. Located at the end of a river gorge in the northern part of the island, Nas offers bathers a one-of-a-kind experience. This small cove is a hidden gem, complete with white pebbles and emerald waters. It’s located in the southeastern part of the island between the village of Therma and the island’s capital of Kyrikos. The star of the island and one of the most impressive throughout the Aegean, the beach of Seychelles never fails to impress. Its aquamarine waters and odd rock formations give it the name taken from the similar-looking archipelago. It can be found along the island’s southern coast, near Magganitis. The sandy beach of Therma can be found on the coast of the village bearing the same name. It’s sandy and features a few umbrellas. You can find it next to the village’s small port. The north and south coasts of Ikaria offers guests opportunities to engage in canoeing and kayaking, with the southern being the more ideal of the two, due to its weather conditions. Faros, the largest beach on Ikaria’s southern shore, is a favourite spot for the sport’s fans. A couple of areas such as Agios Kirikos and Evdilos rent bikes. There are some uphill areas, so some might enjoy hiking on the coastal roads which are only busy in July and August. One of the more scenic routes to take is from Evdikos to Raches. In this case it might be better not to take the main road but another road that takes an inner route through the island. Also noteworthy is the more challenging route from Agios Kirikos that goes up high and then descends to the sea, on to the southern beach and back. Undersea explorers will revel in the depths of bot Ikaria’s northern and southern coasts. The wider areas of Faros, Agios Kyrikos and Magganitis are considered the best for diving, due to weather conditions. So grab your equipment and head to the island and explore the riches hidden under the deep Ikarian Sea. Ikaria's gastronomy is woven into the history of the island and has remained a fundamental element of both the island's unique heritage and culture. Here, the local cuisine combines taste with nutrition, resulting in its enjoyment as well as the health and longevity which the islanders are known for, the world over. The secret to Ikaria's local dishes are the high-quality products cultivated from its fertile earth, most importantly in the form of herbs.Other noteworthy dietary staples include olive oil, cheese, locally-raised goat, strong red wine as well as the highly-held tradition of sharing a meal among family and friends. Visitors to the island can easily sample the large variety of Ikarian dishes, such as “soufiko”, a mixture a various cooked vegetables, cheese pies made with kathoura cheese, fried zucchini, tomato and garbanzo bean croquettes, as well as a variety of baked pies featuring zucchini or a mixture of locally-grown greens. Another traditional dish is “gamopilafo”, a rice dish served at weddings. Finally, another island favourite happens to be locally-raised goat stuffed with rice and herbs. Kathoura or Kathouritsa, is the island's most well-known cheese. This white, goat's cheese has been around since the 17th century. It's made of the milk from locally-raised, free range goats and is typically mild, though saltier and spicier versions do exist. Otherwise known as the “Artichoke of Jerusalem”, this rare plant is only found in Ikaria. Kolokasi (as its locally known, goes by other names as well, such as: sunroot, sunchoke, earth apple or topinambur. The edible part of the plant is a bulb, resembling that of the celeriac plant. It's conical in shape and is covered in a thick brown or purple skin. The inner part is white and tough, though it softens from cooking, which produces a sweet flavour. It's leaves are also edible when cooked. The plant flourishes in warm, moist climates and takes roughly fourteen months to be come into season and is available from October to March. In Ikaria, it is usually found growing close to rivers and is found extensively within the regions of Raches, particularly the areas of Magganitis and Varkades. Historically, Kolokasi is believed to have helped the islanders stave off hunger during the second world war. Full of nutritional value and rich in vitamins such as magnesium, phosphorus and potassium, it is also an excellent source of iron and protein. It also contains probiotic fibres and insulin. High in fructose, it makes an excellent alternative to sugar for diabetics. Overall, its extremely beneficial to one's health and easily digested. This plant requires special care, cleaning and cutting, as it is not possible to clean externally. Once the skin has been removed, the internal parts of the plant are cut and washed. In Ikarian cuisine, it is typically served as a salad and paired with garlic puree and of course, Ikarian wine. It can also be cooked with beans or made into a soup, as well as being roasted or boiled along with meat. Despite its great nutritional value, it is never to be eaten raw, as it contains toxic substances which are only removed through cooking. Kaisia is a type of apricot that is eaten own to and including its pit, which is known worldwide for its anti-carcigenic properties. It thrives chiefly during spring and summer, reaching a height of nearly three metres. Until the second world war, Ikaria cultivated and exported great quantities of Kaisia. Today, production is minimal and the fruit is mainly consumed as a spoon sweet. Locally referred to as “anama”, Ikaria produces some of the finest honey in Greece. The bees which produce it, collect pollen from a bush known as reiki. This gives it a thick texture in comparison with other types of honey. It's become world-famous for its beneficial qualities which are believed to attribute to the longevity enjoyed by the islanders. Other varieties are also produced on Ikaria such as pine, thyme, and various wild flower types. Honey produced on the island is widely used as a cooking product, as well as an important ingredient in local desserts. Ikarian honey is even used as a beauty product. Known both for their intoxicating scent and taste, Ikaria's wide variety of herbs can be found from its mountain tips to its plains and gardens. Oregano, thyme, sage, chamomile, pennyroyal, heather, rosemary, mint, fennel, peppermint and wort grow in abundance throughout Ikaria, and the islanders use them both medicinally and within their cuisine. It goes without saying that herbs are held in great esteem here, being attributed to the long, healthy lives enjoyed be the islanders. The wold goats of Ikaria or “Raska” as they are also known, are white or black and of medium height. They graze the highlands of the island freely, and their meat is delicious, with little fat. As the most popular food during festivals on Ikaria, the meat is eaten either boiled or cooked. Goat was a food which contributed to the survival of the islanders during the difficult times when pirate raids were all too common. Several years earlier, Ikarians made what is known as “Kariotiko Pastourma”, a kind of goat meat jerky that was hung up during the month of August to become preserved. Ikarian olive oil is a unique product of the island and its people. It's used in virtually all the dishes of local cuisine, and its high purity makes it extremely healthy. The amount produced is sufficient to meet the needs of the entire island. The sea surrounding Ikaria is extremely clean and rich in every type of fish. Every day, fishing boats make their rounds near the neighboring islands of Fournoi and Samos, as well as every corner of the island, and their “catch” is plenty to supply the households and taverns with fresh fish and seafood, such as scorpion fish, sea bream, smelt fish, parrot fish, octopus, and squid. All the delicacies of the Ikarian Sea can be enjoyed next to the water, with a variety of appetizers accompanied by ouzo, or local grappa known as “tsipouro”. Spoon sweets have their own special place in Ikarian cuisine. Every household fixes their own from local fruit, such as Kaisia, oranges, cherries, fruit of Pergamont and even rose petals. Today, local producers and women's agricultural co-ops package their sweets and sell them both locally and outside the island. Nature lovers will discover another dimension of Ikaria via its intricate network of paths, leading hikers from coast to coast, through forests and from one mountain top to another. Due to the fact that several of the island's paths are unmarked, hiking solo is highly discouraged, and trekkers should better yet, hike with someone familiar with the trails. This can also be done with the island's hiking association, which frequently organises excursions. Equally as important is making the right preparation, such as wearing proper footwear and attire, keeping in mind that weather can change quickly on the island. Bringing adequate food and water is also considered a 'must', due to the remoteness of many of Ikaria's paths. Ikaria invites you to discover the wild beauty of its mountainous terrain, lush ravines and sheer cliffs. Aside from water sports, adventure-lovers have plenty to explore; from Paputsokrifti to Athera, visitors can experience the hidden beauty that the hinterlands of Ikaria have to offer. The island’s mountain hiking association is quite active on the island, and has a wealth of knowledge and experience on how to discover the island in a safe manner. Ikaria and its vast blue sea, provide the perfect backdrop for visitors to fall in love with the sport of sailing. It’s also one of the most sought-after destinations among the sport’s enthusiasts during the summer months; as either the home of several annual competitions or a stop within other contests’ routes. Visitors and residents alike are granted the opportunity to follow the races or even moor their own vessel in one of the island’s two marinas within the larger ports. Provided there’s enough room, Ikaria’s smaller harbours can also accommodate guests’ boats, if necessary. The island of Ikaria is an area which has been well-endowed with geothermal activity. This is due to its unique tectonic structure and geological formations, which have blessed the island with a number of naturally-occurring hot springs, whose nutrient-rich waters have their source under the seafloor and are carried to the surface via system of cracks and leaks. The temperature of the water found within the springs ranges anywhere from 310 – 580 degrees celsius. The radiation of the springs, mainly in the form of radon is highly beneficial to the human body, and Ikaria's springs are some of the most radioactive in the world. Most of the island's springs can be found along the northeast and southeast coasts and several hydrotherapy centres operate in the areas of Therma and Agios Kyrikos. Fyrodi is a great sandy beach near Magganitis and is very popular with the locals. This laid back beach on the island’s north side features views of the picturesque fishing harbour and the Church of Analypsis. This popular swimming spot lies beside the small marina of Magganitis village and features crystal clear water. The sandy beach of Glyfadi can be found on the north eastern side of the island. Backed by trees offering natural shade, this beach is located just east of Therma. Its name aptly meaning “sacred”, this secret sandy beach has been a well-kept secret due to only being recently made accessible. It lies along Ikaria’s northern coast. Along with its ancient city and archaeological site, Kambos’s sandy beach is popular with visitors and has all the amenities one could need nearby. Lying at the island’s westernmost point, this clean, pebbly beach is perfect for those looking for some peace and quiet. One of two beaches on the island with the same name, this sandy swimming spot is located near Evdilos, on the northeastern part of the island. The second of two beaches with the same name lies east of Therma, on the way to Faros. It’s a small, sandy cove, far away from the crowds. This small sandy beach lies next to Kerame beach, near Evdilos. The rocky beach of Lefkada can be found on the island’s southern coast, in an area known for its hot springs. It can be found along the road leading from Agios Kyrikos to Xylosyrti. Featuring fine, golden sand and turquoise waters, this is one of Ikaria’s finest beaches. Located between the beaches of Messakti and Armenistis, Livadi is a great choice for families with children, as the water is shallow and there are umbrellas and sun loungers available. The picturesque and unique beach of Messakti is one of the island’s most well-known. The Myrsonas River flows behind it, creating a wetland, and along with it, an almost tropical setting. Located just east of Therma, the remote, mostly pebbly beach of Nealia offers swimmers clear waters and relaxed sunbathing surrounded by green hills and close to thermal springs. Nealia beach envokes a sense of wild beauty and timelessness. Nyfi is a pebbly, average-sized beach along the way to Faros along the northeastern side of the island. Taking its name from the Greek word for “thought”, you’ll know you’ve arrived at this beach when you see the statue of the “thinking man”. The beach is located along the road leading from Agios Kyrikos to Xylosyrti in the southern part of the island. This small beach can be found next to the village of Trapalou in the southern part of the island. Surrounded by mountains and near a few great taverns, this beach is a great place to “get away from it all” while still taking advantage of some nearby comforts. This beach hares its name with the village its found within. Located in the southern part of the island along the road from Agios Kyrikos to Magganitis, this pebbly beach is backed by trees and surrounded by the wild beauty of Ikaria’s mountains. 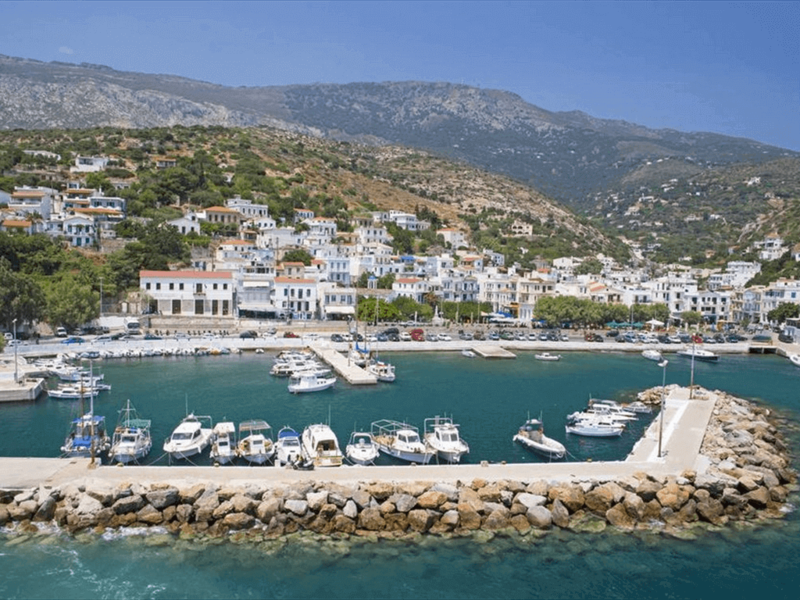 The island of Ikaria is one of Greece's most impressive and important ecosystems, featuring a rich variety of both flora and fauna, as well as various landscapes made up of lakes, rivers, springs and caves. Additionally, there are several wetland areas throughout the island which are worth visiting. Many of Ikaria's prized natural sites are officially protected and belong to the Natura 2000 initiative within the categories of Areas of Exceptional Natural Beauty, Important Bird Areas, and CORINE Habitats. With 92 families, 401 genuses and 829 species of plants, Ikaria's flora is one of the most diverse throughout Greece. In the southern part of the island, there are several endemic species and sub-species, such as: Ikarian Peony (Paeonia muscula cariensis), and the unique species Iberis runemarkii, which can be found in the area of Plagia. Several of these endemic species are protected under Greek law, as they are considered endangered, such as: Linum gyaricum, Verbascum ikaricum, Nigella icarica, Polygonum icaricum, Symphytum icarium, and Rorippa icarica. Other varieties found on the island include: Campanula hagielia, Pteris dentata, Corydalis integra, Muscari macrocarpum, galanthus ikariea, digitalis cariensis (found only in Ikaria), Dianthus elegans, and Symphytum anatolicum. Pristine forests thrive on the island, due to minimal human interference in those areas of the island. Additionally, the Hawthorn plant (Crataegus monogyna), known on the island as “Perikathe”, grows in the highlands of the island and produces fruit which is considered beneficial to the human body. Due to its great variety of landscapes and habitats, a large number of fauna can be found throughout Ikaria. Some noteworthy examples are the hedgehog, which can be found in the plains of Fanari, endemic species of reptiles originating from Asia Minor, such as the Turkish lizard (Lacerta oertzeni) the gecko (Hemidactylus turcicus, the skink (Ablepharus kitaibelii), the snake-eyed lizard (Ophisops elegans) the starred Agama (Laudakia stellio) the wall lizard (Lacertidae lacertinae) and the Lizard of Ikaria (Lacerta oerizeni) which is only found on the island. Some of the most frequently seen snakes of Ikaria include the Caspian whipsnake (Coluber caspius), Eastern montpillier snake (Malpolon insignitus) as well as the protected Ottoman viper (Vipera xanthia). The island boasts a wide range of birds, including the Aegean gull, and the European shag. It also constitutes an important breeding ground for predatory as well as migratory birds, such as the Long-legged buzzard (Buteo rufinis), Bonelli's Eagle (Hieraaetus fasciatus), Cinereous bunting (emberiza cineracea) as well as species of international interest, such as the White-tailed eagle (Haliaeetus albicilla) and the Lesser kestrel (Falcona umanni). Three species of protected bats can also be found on the island, such as Blasius's horseshoe bat (Rinolophus blasii), the Lesser mouse-earred bat (Myotos blythii), and Geoffrey's bat (Myotis emarginatus). In the waters surrounding the island, particularly along the northern coast, threatened species can find shelter, especially along the northern coast, such as the Mediterranean Monk Seal (Monachus monachus) and dolphins, including the common bottlenose dolphin (Tursiops truncatus), and the striped dolphin (Stenella coeruleoalba). As the birthplace of Dionysus, it’s no wonder that Ikaria’s wines have been famous since antiquity. The god of revelry is said to have been born in a cave near Drakano, and the island’s strong red wine known as Pramneios wine, was particularly connected with ceremonies devoted to his worship. Dark red in colour, it’s a naturally strong wine, reaching upwards of 16% alcohol content, something that occurs in few other places outside of Ikaria. Its beneficial qualities are cited numerously in mythology and Homer mentions a cocktail known as “kykeon” which was derived from Pramneios wine, barley flour and local cheese. It was given to warrior to both strengthen and heal them during battle. Today, the closest version to Pramneios wine is a variety known as Fokiano. With a history reaching back as far as 150 A.D., this wine is made from large, red grapes, conical in size and lacking a bitter texture. The grapes are cultivated in rounded terraces within soil containing high amounts of limestone and slate. Their resistance to drought played a large role in the variety’s ability to survive throughout millennia. The grapes ripen from May to September. Aside from Fokiano, Ikaria produces several other grape varieties, such as Begleri, Athiri, Asyrtiko, Baftra and Mandilaria. Red, white and rose types can be found ranging from dry, semi-dry and semi-sweet. All in all, the island produces twelve local wines, some which are organic and all of which you can sample throughout the four wineries, where visitors can learn the secrets of this age old tradition on Ikaria.